Halve the cakes horizontally, place on a tray lined with non-stick baking paper and freeze for 1 hour or until very firm. Place the ice-cream in an electric mixer and beat for 1–2 minutes or until softened. Place the ice-cream in the freezer for 1 hour or until firm but spreadable. Working quickly, spread 1⅓ cups ice-cream between each cake layer, pressing slightly before creating the next layer and finishing with a layer of cake. Smooth the sides with a palette knife and return to the freezer for 2–3 hours or until completely frozen. Place 1¼ cups sugar (275g), cream of tartar and water in a medium saucepan over high heat and stir with a metal spoon until the mixture is just combined. Bring to the boil, reduce heat to medium and cook for 4 minutes. Place the eggwhites in an electric mixer and whisk until soft peaks form. Gradually add the remaining sugar and whisk until stiff peaks form. While the motor is running, add the sugar syrup in a thin, steady stream and whisk for 2–3 minutes or until thick and glossy. 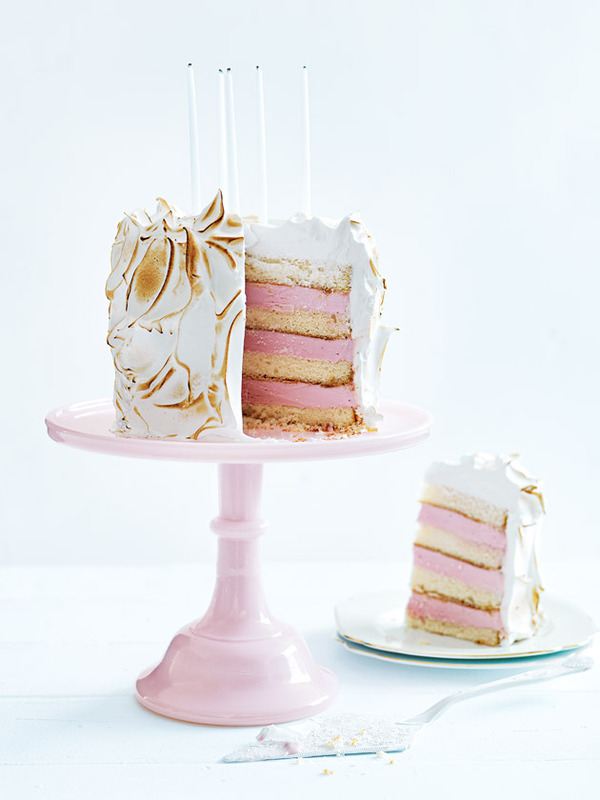 Place the cake on a serving dish and spread with the meringue. Using a kitchen blow torch, toast the meringue for a few seconds or until golden. Serve immediately or return to the freezer until ready to serve. Serves 8–10. + When freezing the sponge cake layers, separate them with non-stick baking paper or the layers will stick together. + Before softening the ice-cream, place in a metal container in the freezer to prevent the ice-cream from melting. + Keep the cake in the freezer for 2–3 days. + Remove the cake from the freezer 20 minutes before serving. + Exercise a little caution when using the blowtorch, especially if you are serving the cake on a delicate platter.